Many of us who wear glasses everyday will probably find ourselves relating to these two sentences. Both sentences are from a circa 1890 trade catalog titled A Talk About Eyes, Spectacles, Opera Glasses and Lorgnettes by M. Zineman & Bro. Besides advertising products sold by the company, the catalog includes a brief history of eyeglasses and spectacles, tips for care of the eyes, and a section on artificial eyes. 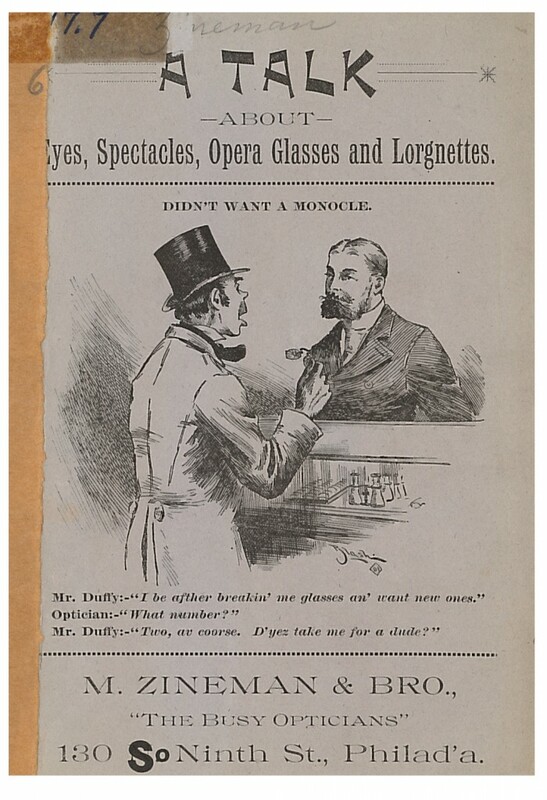 M. Zineman & Bro., Philadelphia, PA. A Talk About Eyes, Spectacles, Opera Glasses and Lorgnettes, circa 1890, front cover, man ordering eyeglasses. 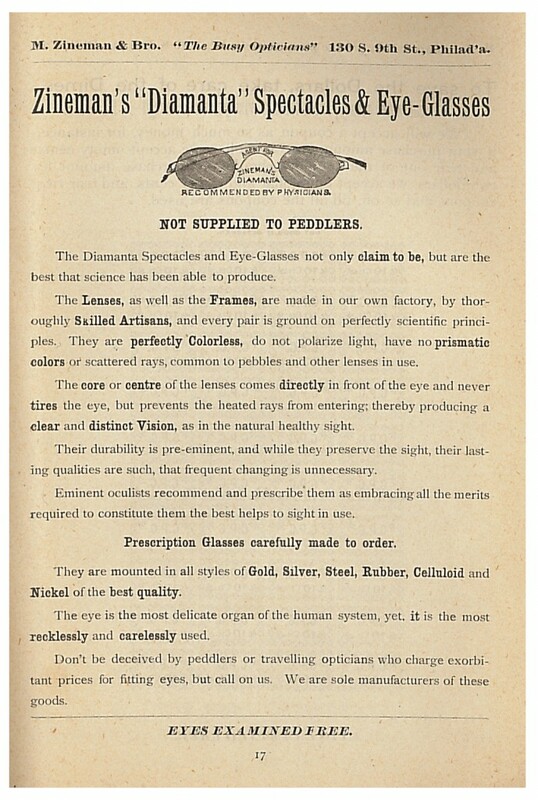 One product advertised is Zineman’s “Diamanta” Spectacles and Eye-Glasses. The lenses were described as being “perfectly Colorless.” They did not polarize light and had no prismatic colors or scattered rays. And the center of each lens was positioned directly in front of the eye which “never tires the eye, but prevents the heated rays from entering; thereby producing a clear and distinct Vision, as in the natural healthy sight.” Both the lenses and frames were manufactured in the factory of M. Zineman & Bro. M. Zineman & Bro., Philadelphia, PA. A Talk About Eyes, Spectacles, Opera Glasses and Lorgnettes, circa 1890, page 17, Zineman’s “Diamanta” Spectacles and Eye-Glasses. 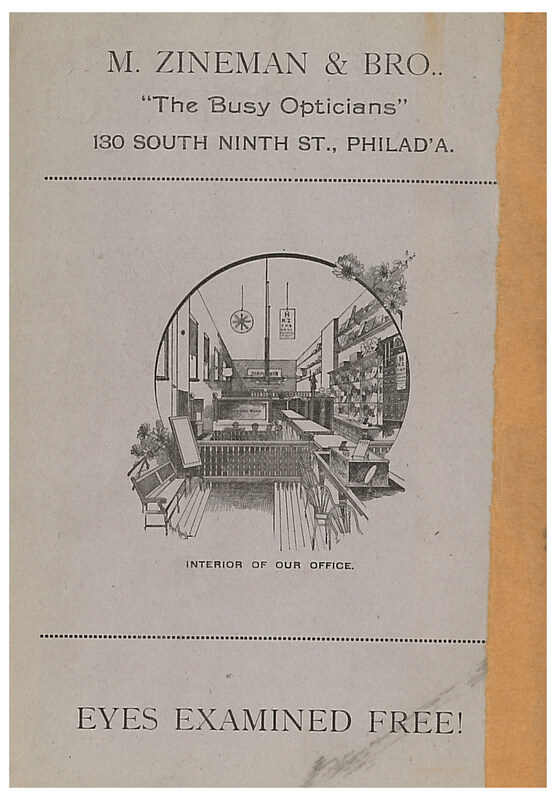 M. Zineman & Bro., Philadelphia, PA. A Talk About Eyes, Spectacles, Opera Glasses and Lorgnettes, circa 1890, back cover, interior view of the office of M. Zineman & Bro. A Talk About Eyes, Spectacles, Opera Glasses and Lorgnettes is located in the Trade Literature Collection at the National Museum of American History Library. The collection also includes many more eyeglass related catalogs by other companies which can be found by searching the Collections Search Center. Previous Post Ask Our Book Conservator Anything! Next Post Who’s that Bird?